The Biden Foundation has launched a campaign aiming to increase family acceptance of transgender and gender diverse youth. The foundation, established by former Vice President Joe Biden and his family after departing the White House in 2017 to fight for equality of all people, has partnered with LGBT+ groups Movement Advancement Project (MAP) and Gender Spectrum to create the “Advancing Acceptance” campaign, launched on February 5. The three organisations have made available a number of resources to support families of transgender and gender diverse children on how to best provide support, including an infographic on the positive impact of family acceptance on trans youth. The foundation cites a study published in the journal Pediatrics in 2016 indicating that transgender kids who are supported by their families and communities do not experience disproportionately high rates of mental health issues such as anxiety and depression. Similar research published in 2018 in the Journal of Adolescent Health, also showed that allowing young transgender people to use their chosen name drastically reduces the likelihood they will attempt suicide, suffer depression or have suicidal thoughts. Ineke Mushovic, executive director of the Movement Advancement Project, said: “Too many families, and the lives of too many transgender children, have been devastated by parents who reject these children or try to force them to be someone they’re not. Emily Hecht-McGowan, director of LGBT+ equality at the Biden Foundation, told NBC News: “Some people don’t understand that some of what they are doing and saying are actually harmful to young people. Among the resources available as part of the campaign is a Q&A with Hilary Berman and Jon Ruth, the parents of 16-year-old transgender boy Xander. Xander began voicing his gender identity from a young age, and was targeted by two bullies at elementary school. “The school used the opportunity to provide transgender awareness and anti-bullying discussions for the kids. We also talked to the parents to help them understand what happened,” Berman and Ruth explained. Another challenge Xander faced was his grandfather not referring to him with male pronouns. His parents advised he wrote his grandfather a letter explaining his wishes and his journey, and his grandfather listened. “Eli still gets frustrated with himself when he messes up pronouns sometimes, and Xander is very understanding. He really appreciates the effort, and they have had good conversations between the two of them. It’s a good lesson for advocating and owning one’s identity and journey,” Xander’s parents said. The Berman-Ruth family also shared their story as part of a video released as part of the campaign. In the video, they appear with their close friends, the Wylie family, who have known Xander since he was five years old. “He just wants the same things that every other kid wants. And I, as a mother, just really want him to be treated equally,” Berman says in the video. The Biden Foundation’s Hecht-McGowan hoped that their story can help other families across the US. 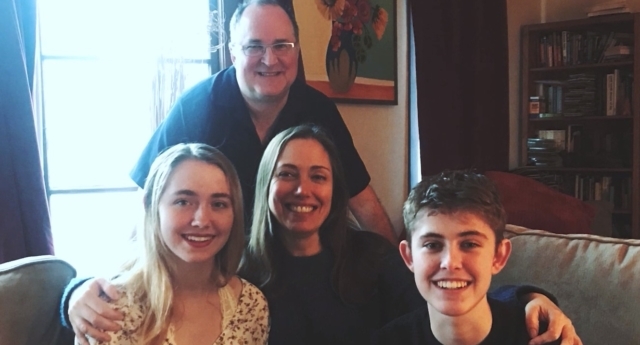 “Families like the Wileys and Berman-Ruths are a beautiful and necessary example of how acceptance can and should look in every home and community across America,” she said. In August, the foundation announced a similar campaign, which was aimed more broadly at increasing family acceptance of LGBT+ youth. The campaign, called “As You Are,” was backed by a number of high-profile figures including Cyndi Lauper and former NFL star Wade Davis and invited people to share their story to help educate the public about the importance of affirming, accepting, and supporting LGBT+ youth. “We know that all children are affected by harmful gender stereotypes, and strict gender roles are especially challenging for transgender youth,” said Lisa Kenney, executive director of Gender Spectrum.